HOPKINSVILLE, Ky. — Science teacher Jane Irwin isn’t often left without words, but the total solar eclipse left her in a quiet reflective mood. “Awesome. God’s amazing” was the best she could muster after the sun reappeared from behind the moon after totality Aug. 21. Irwin was among about 50 people gathered at Sts. Peter and Paul Parish in Hopkinsville, the town near the point of maximum eclipse. She planned to have her students write about the eclipse when classes resumed Aug. 23. Her inspiration for the assignment was Jesuit Brother Guy Consolmagno, director of the Vatican Observatory, who spoke at the parish Aug. 20 during a pre-eclipse program. “Brother Guy said if you didn’t write about it, it didn’t happened. Hopefully, in 10 years when they pull that out, they’ll remember and be inspired by what they saw,” Irwin said. Joining her was one of her students, Tim Sunderhaus, 8, a third-grader at the parish school. Tim was accompanied by brothers Luke, 12, in seventh grade, and Peter, 10, in fifth grade, and father Todd. Luke called the eclipse an amazing sight. He found the sun’s corona — the intensely hot outer atmosphere visible from Earth only during a total eclipse — most interesting to observe. “I was thinking it finally happened because people have been talking about it for such a long time,” he told Catholic News Service. Cheers and whistles erupted in the parish parking lot where viewers had gathered as darkness approached and the corona appeared around a black hole. Three bright red prominences appeared along the right edge of the sun during totality. People called out the planets as they appeared. First there was bright Venus to the west of the sun and then Mercury very close to eastern limb of the star. Crickets began chirping, thinking night was approaching. The air cooled several degrees as the moon’s shadow deepened. The entire event was impressive for Franciscan Father Richard Goodin, vocation director for his order’s St. John the Baptist Province based in Cincinnati. The Kentucky native drove from Cincinnati overnight to see the eclipse after a redeye flight from Las Vegas where he preached at Masses Aug. 19 and 20 making a mission appeal. Hopkinsville officials and business owners had worked for nearly two years to capitalize on the eclipse. They billed their town as “Eclipseville.” Located near the point of maximum eclipse, the city of 33,000 wanted to showcase its friendliness and the quality of life it offers in largely agricultural Christian County. Eclipse chasers started arriving Aug. 18 and by the morning of the event traffic crawled along city streets. Some of those travelers made their way to a field the parish owns across the street from the church. Spots were going for $10. Some stayed overnight, camping in tents or in the back of their vehicle. Others, arrived in the pre-dawn hours eager to catch the spectacle. Ron Howell and Cheri Ricketts, members of St. Catherine of Siena Church in Toledo, Ohio, were sitting in chairs next to their Chevrolet Equinox enjoying coffee in the warm early morning sun. They said they wanted to see something they had never seen before and that Hopkinsville was a reasonable distance to travel. “We’re basic, but we’re prepared,” said Howell, 72. “I’m sure it’s going to be spiritually moving, just to see the wonder of it all and the precision,” Ricketts, 66, added. Across the lot Hendrik Schultz, professor of nuclear astrophysics at Michigan State University, sat with his daughter, Lilley, 16, enjoying a slight breeze in the shade of tall trees. He said he brought his daughter and her boyfriend along so they could see something rare and beautiful. But he was leaving the physics of the eclipse out of any discussion as he showed off the pinhole tube he made to observe the event. “I don’t want to spoil it with too much science. It’s like a waterfall. You wouldn’t want a lecture on hydrology. You just want to enjoy it,” he said. In another corner, Jayden Braga, 5, patiently waited for the eclipse as his parents, Derrick and Alissa Braga of Rochester Hills, Michigan, tended to housekeeping chores in their tent. The family traveled all night to arrive in time for the celestial wonder. The youngster explained how important it was to view the eclipse with special glasses until the moment of totality. Then he became more animated. In his presentation the evening before, Brother Consolmagno urged people to let the eclipse be an example of God’s design for the universe and to appreciate the beauty of ongoing creation. The presentation before a full house in the church was one of several special events leading to the eclipse. The city also planned a downtown festival over the weekend before the skies darkened. Vendors hawked T-shirts, Christmas tree ornaments, plaques, jewelry, posters and anything else they could creatively tie to the event. Sts. Peter and Paul parishioner Maureen Leamy took time Aug. 19 to visit the vendors during the downtown festival. 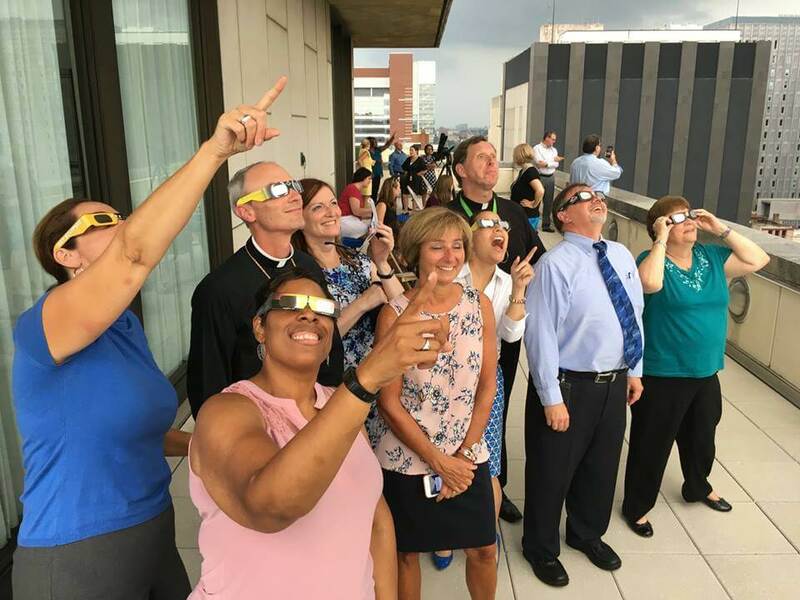 An assistant county attorney for Christian County, Leamy was looking forward to seeing the eclipse, even though it meant that Tuesday will be a busy day for hearing criminal cases from the long weekend the court was closed. Andra V. Gold, owner of Accessories Plus in Hopkinsville, made several dozen T-shirts with a snappy message: “Keep calm. It’s only the eclipse.” He said he sold a few shirts, but more importantly the eclipse and the celebration surrounding it was a way to meet people, some of whom traveled hundreds of miles to southwest Kentucky, and impart a few words of wisdom.